Irish ex-pat Aine Greaney's prose is as poignant and lyrical as her charming accent, and her short story, "Snow," which is set in the Irish Midlands, lives up to the great storytelling heritage of her homeland. Irish short stories have a certain lilting poignancy unlike any others. Aine Greaney's tales about botched desires transcend romance, to illuminate our all too human contradictions and longings. As you brace for the heat of summer, stay cool with a lilting Irish short story: "Snow" by Aine Greaney, which will be published as an eBook this Friday by Pixel Hall Press. The neat thing about an eBook short story is that it's a delight to read (and finish in a single sitting) on any device on hand: an iPhone or other smartphones; Kindle, Nook or any eReader; tablets such as an iPad or Galaxy; or your laptop or computer. Set in a one-street small town in the Irish midlands, "Snow" is a stylish portrait of Dolores, a young expatriate Irish woman who is suddenly summoned home from America to take care of her estranged and sick father. In her childhood home, Dolores wrestles with the push and pull between her new American life and her past life in Ireland. As she nurses her father back to health, she is beset by memories and caught between family loyalties and her own desires. "Snow" will be immediately available as an eBook for only 99 cents from Amazon and Apple, and from Barnes and Noble and Kobo within a short time. 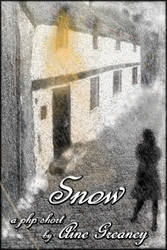 Reviewers and book bloggers may contact Cynthia Dadson, the Marketing Director of Pixel Hall Press -- Cynthia [at] PixelHallPress [dot] com -- for review copies of "Snow." An Irish native who now lives and writes on Boston’s North Shore, Aine Greaney's most recent writing recognitions include a Pushcart nomination and selection as a "notable" in Best American Essays 2013. Other writing awards and shortlists include the Hennessy Award for New Irish Writing, the Fish Anthology, the Rubery International Book Award, the Frank O'Connor Award, the Irish News Short Story Award and Indie Lit 2011. Aine is the author of four books (two novels, a short story chapbook collection and a book on writing). Her fifth book What Brought You Here? (a memoir) is a work-in-progress. Her personal essays and short stories have been published in consumer and literary publications such as Salon.com, The Boston Globe Magazine, Forbes, The Daily Muse, Generation Emigration, The Irish Times, Writers Digest and Books by Women. In addition to writing, she presents and teaches at various conferences, book clubs, arts organizations and schools. Pixel Hall Press is a relatively new, old-fashioned small publishing house that is quickly becoming known for discovering literary gems and great stories that might have otherwise been overlooked. In addition to publishing its more traditional full-length books in both print and eBook formats, Pixel Hall Press has launched a new imprint: PHP Shorts. PHP Shorts publishes stand-alone short stories and novellas as eBooks.